Bio: Greg Goebel is the founder and managing editor of AnglicanPastor.com. He is an Anglican Priest of the Anglican Church in North America. He served in a non-denominational church before being called into the Anglican church in 2003. 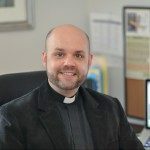 He has served as an Associate Pastor, Parish Administrator, and Rector. He currently serves as the Canon to the Ordinary for the Anglican Diocese of the South.